The last week really got away from me. The Helvetican and I went to Yellowstone for our anniversary trip. Most everything inside the park was closed for the season, and the town of West Yellowstone, where we stayed, was clearly wrapping up the tourist season too. Some of the restaurants were closed and several shops advertised clearance sales. However, having been to Yellowstone during the regular season and now, in the off-season, I much prefer going when there’s not so many other people around. It’s much quieter and the pace is slower. Good stuff. My trip didn’t end on such a grand note, due to food poisoning the last night that made the drive home the next day a bit uncomfortable and exhausting, and left me kinda under the weather all week. But let’s not let that get in the way of good memories. On to the photos! One of the great things about visiting Yellowstone in the fall is that you can look around the park as you’re driving and see steam rising from all the thermal features in the park. It’s amazing to see. However, it made taking photos of said features a bit tricky. 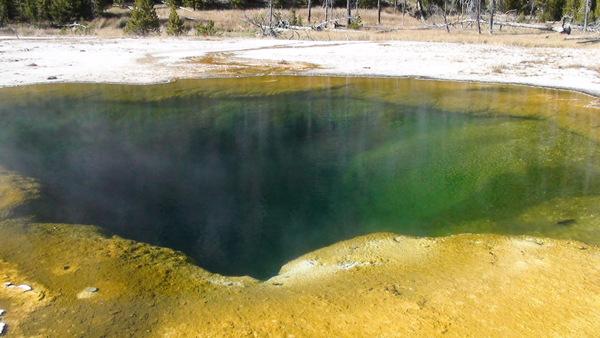 Emerald Pool is one of the many colorful thermal pools in the Yellowstone caldera. Most of them were impossible to photograph because in the cold air, the rising steam obscured the colors. 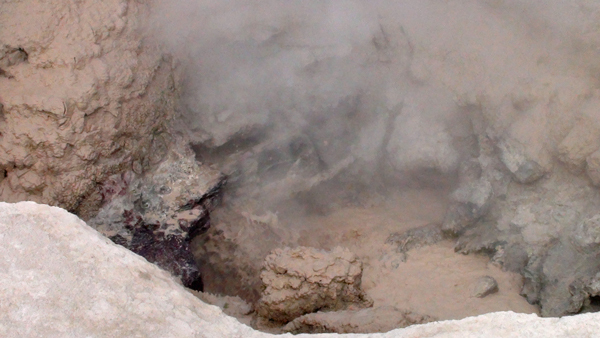 One of the many bubbling mudpots in the park. Many are reduced to hissing out steam rather than frothing with mud due to lower water/mud levels this time of year. I got a kick out of this mudpot. 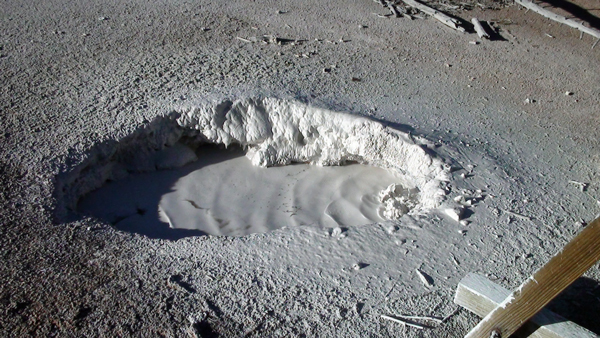 Found in the Artist’s Paint Pots area, this one looks like bright white paint bubbling in the ground. Definitely don’t want to jump in this pool for a soak. See the boiling going on there? There is a craggy canyon carved through one section of Yellowstone, where the river has been busy wearing away rock for millennia. This is the Upper Falls in that canyon. 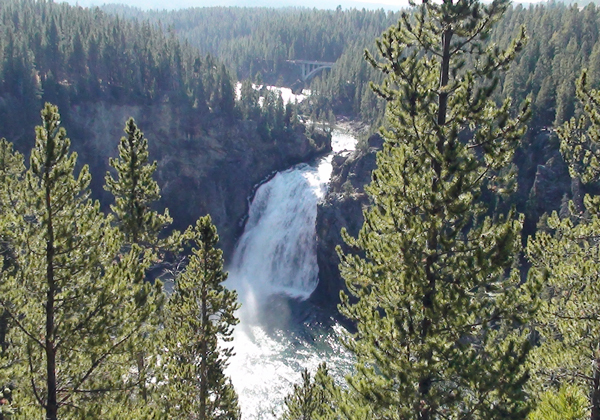 Around a bend in the river/canyon, is another, the Lower Falls. I met these two cuties at the lookout for the Lower Falls. The tree roots they’re playing on have had the ground eroded from below. 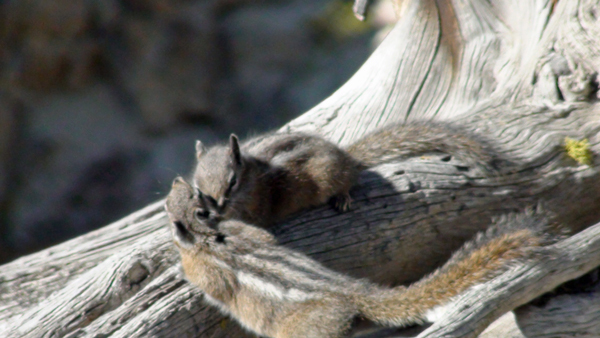 There’s a drop almost straight to the bottom of the canyon beneath these cute critters. Here’s the Helvetican! 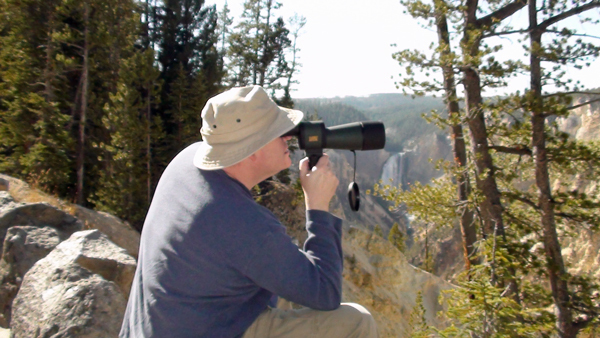 He brought his little telescope to better enjoy the features of the canyon. 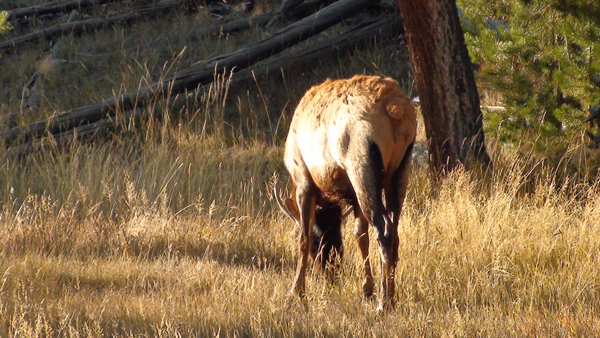 This pretty elk stopped traffic to grab a bite along the road. 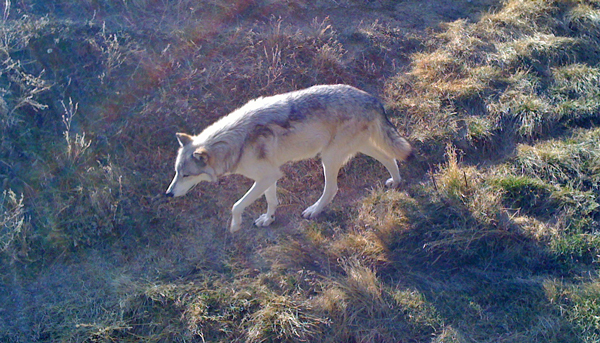 One of my favorite parts of the trip was a visit to the Grizzly & Wolf Discovery Center in West Yellowstone. The wolves living in their packs are gorgeous animals. I loved getting so close to them, separated via a platform a few feet in the air and an electric fence. Apparently, if you stay in the hotel across the street, you can hear them howl at night. That’s probably enough photos for now. 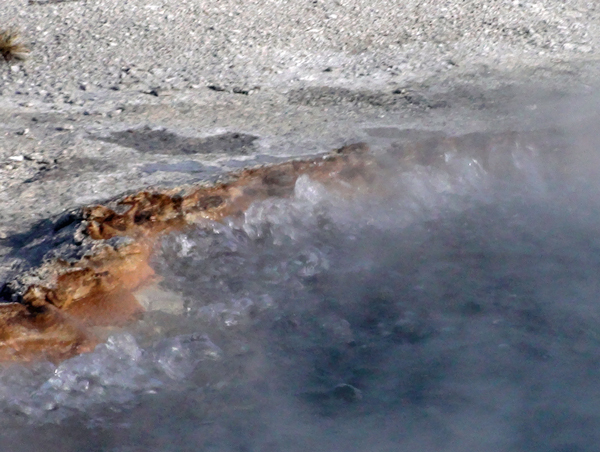 I didn’t post geyser photos, mainly because there are photos of Old Faithful everywhere online. I may post more on here later, but at some point, it becomes rather like the old days of friends inviting you over to watch their home movies, you know? 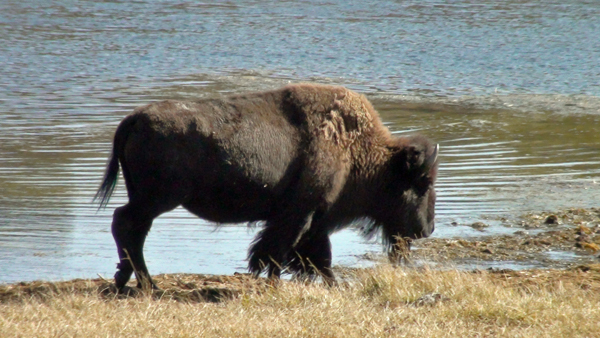 Have you been to Yellowstone? What was your favorite sight? Wow, how beautiful, Lucy! 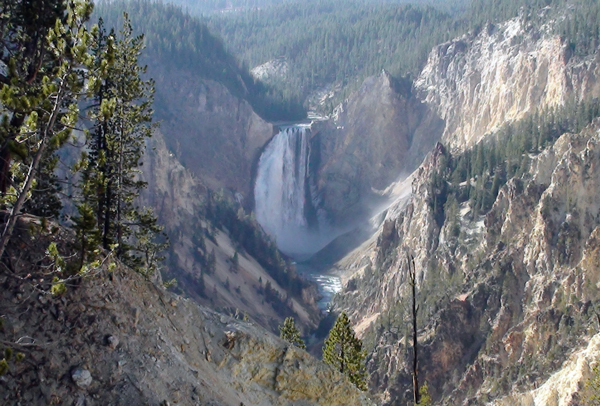 I have never been to Yellowstone but it’s one of the places my husband and I plan to visit. I admit I have an extreme phobia about bears but I was enthralled by the wildlife photos, especially of the wolf. And I would love to see the Paint Pots. Sorry to hear about the food poisoning. Ack! Other than that, it sounds like you had a wonderful trip. Thanks for sharing such gorgeous photos! Thanks for stopping by, Mae! It really is an amazing place to visit. One of the main roads in the park was closed for rebuilding–apparently the same road that goes through the main grizzly territory of the park, so the only bears I saw this trip were at the Grizzly & Wolf Discovery Center. My photos of the bears didn’t turn out so well, though, darn it. That was awesome! Loved seeing Peg-leg up close, and the wolves, and the waterfalls! Too beautiful for words. I’m sure it was even better in person. It was an awesome adventure. Maybe I’ll put some of my video clips of the geysers up one of these days. Fun stuff! Thanks for dropping in, Mia! Oh! I love Yellowstone. It’s where my parents met. My mom was a maid at Old Faithful Inn and my dad delivered the sheets. Cute, huh? 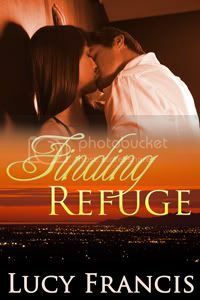 Such a great place for romance! That’s such a sweet setup for a romance, Amy! Love it!